Clippers can be forgotten over the years. You clip your horse, give them a brush off and put them back in their case. It is only when you need to clip your horse again that you remember the problems you had last time. The strange noises that they were making, the fact that they were getting so hot that you could barely hold on to them, and that they kept cutting out every time you moved them around. Or worse still they just won't work. At Oakside Saddlery I can strip your clippers down, give them a thorough clean, inspect for damage and electrical safety, and make any necessary repairs, before applying fresh lubricants, reassembling and returning to you. Price for a standard service is just £25 plus postage. If the clippers need replacement parts I will contact you with the revised cost before proceeding. Just print and complete a Clipper Condition Report and post to me along with your Clippers, or alternatively complete the online clipper condition report form before sending me your clippers. Please make a note to deliver to Number 69 if not in. Please note that if your clippers are not mains powered, I will also need the power pack and charger to enable the clippers to be run up and tested. Please remember that Royal Mail will not take batteries. Dog grooming Clippers and Blowers, driers, and blasters. I've even had to repair electric fencing units! Standard postage is via Royal Mail/Parcelforce and is £15. This is a tracked service and insured up to £250. Why not have your blades sharpened at the same time. I use Swale Sharpening Services in Minster-on-Sea to sharpen my blades. Just add £8 per set of horse clipper blades. A set of Horse clippers on first inspection. After removing the clipper blades, gearbox and top cover, the amount of horse hair inside the clippers becomes apparent. This will be the cause for the horse clippers overheating. The horse clippers keep the temperature down by a fan which draws air through the air filter, over the circuit board, through the motor and out over the clipper blades to keep them cool. The horse hair trapped with in the clippers casing will block this air flow and cause the horse clippers to overheat. 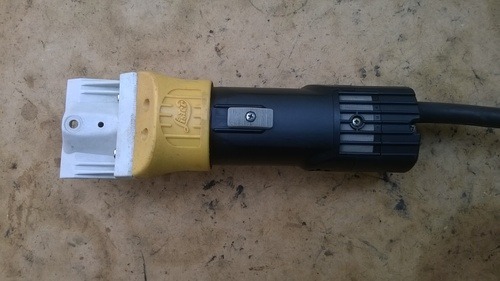 I completely strip the horse clippers into their component parts, removing the motor, brushes and circuit board to enable all parts of the horse clippers to be accessed for cleaning. Plastic components are washed in soapy water, degreased, and thoroughly dried with an air gun. The electrical components are blown clean and brushed with a soft bristle brush to remove all signs of horse hair. The clipper's motor commutator ring on the rotor is cleaned with a petrol soaked cloth removing all signs of carbon residue. All of the remaining parts are degreased and blown dry. Once the horse clippers are completely clean I thoroughly inspect for any signs of excessive wear or damage. Particular attention is paid to the motor bearings and to the length of the brushes, also to the fixed wiring and the circuit board. If anything needs repairing I will contact you with a revised price. If all is OK, reassembly starts. All bearings are lubricated and the gearbox is re-greased if required (some gearboxes are of the dry type). 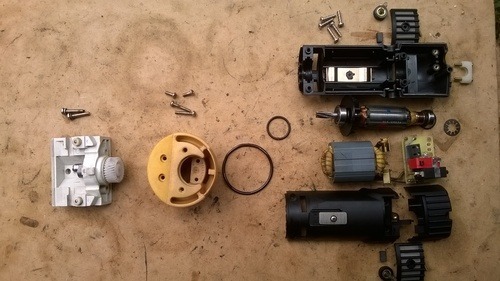 The rotor is assembled back into the stator and the entire motor assembly is placed back into the casing along with the printed circuit board and the other ancillary components. The casing is reassembled and the motor is tested. Finally the gearbox and clipper blade assembly is refitted before final testing. The clippers are then portable appliance tested and marked accordingly. Overheating - Usually caused by an excessive build-up of horse hair within the clippers body but may be due to a motor fault or damaged fan. Intermittent running - Horse clippers cutting out when they are moved around is commonly caused by the inner wires in the cable breaking down causing a break in the cable. Motor running but the blades aren't moving - Usually the main cog has worn out. But could be other causes also. Excessive noise - Due to bearing failure in the motor or excessive hair blocking the components. Non-operation - A variety of reasons that could include; a damaged cable, faulty thermofuse, burnt-out circuit board, damaged internal wiring, motor fault, and many more. The wrong fuse being fitted. Cable not clamped into the plug correctly. Damaged cable showing the inner wires or taped up. The wrong cable or a non standard plug fitted. Are your Horse Clippers getting hot when you try and clip your horse? 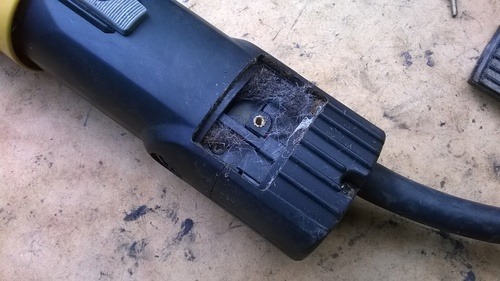 This is usually caused by an excessive build up of hair in the clippers cooling air flow. Leave them blocked for too long and the clippers will become so hot that you can’t hold them (Imagine how this feels on your horse!). Continue using them and the Thermofuse may pop or worse still the motor burns out. To help prevent this you should have your clippers cleaned and serviced by Oakside Saddlery. Your clippers will be disassembled, cleaned, inspected, reassembled, and tested, making your clippers run like new again.